How to hire a sales lead management service to assist business marketers with inquiry handling or sales lead management. You are up to your ears in responses from your B2B marketing programs. You and your staff are overloaded, budgets are due and the major trade show in your industry is right around the corner. You can’t seem to find the time to manage the inquiries or sales leads as well as you know you should. Is there an alternative to inquiry handling in-house? Fortunately, there is. The answer is to hire one of the sales lead management service companies that assist business marketers with inquiry handling or sales lead management. To meet the increasing demand for improved sales lead management and inquiry handling, service companies have become quite sophisticated. Their services are designed to make it faster and easier for your prospects to get the information needed to make buying decisions. They can qualify your prospects for you, get your sales force involved sooner, enhance your service-driven image and provide the data required to measure and increase the effectiveness of your B2B marketing and communications efforts. By answering calls to your toll-free numbers during business hours coast-to-coast or 24-hours a day, these sales lead management service companies can offer prospects fast, easy access to your sales literature and “where to buy” information. They also can provide immediate qualification of inquirers and first level technical support. Fax numbers or email addresses published in your ads and routed to the sales lead management service company make it fast and easy for inquirers to request information and allow for immediate inquiry handling response, electronically or by mail. These response management service companies can also handle information forms and “chat” requests from your website and respond immediately. 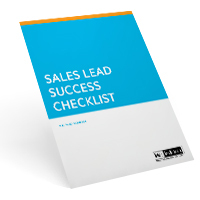 Their advanced sales lead distribution methods let you get sales leads to your salespeople, reps, dealers or distributors by email, fax and mail. However, most of these sales lead management service companies also allow your people to use web browsers to retrieve their sales leads from secure internet sites and many even provide for feedback on results. Most of these sales lead management service companies can forward sales leads as email attachments that integrate with your salespeople’s existing contact management software or corporate customer relationship management or sales automation systems. Outbound telemarketers at the service companies can generate sales leads, qualify prospects, perform “Did you buy?” studies, build relationships with longer-term prospects and invite them to seminars. Some can even sell your products or services, when appropriate. These response management service companies can develop and manage your sales and marketing databases, clean them up and append data from postal and public databases, enhance them through feedback from salespeople and inquiry handling and direct mail and telemarketing efforts, and let you keep in touch with and convert more prospects to customers. Your database also can be used to track and analyze activity and results by territory, product, media or other criteria. Sophisticated reporting capabilities offered by the sales lead management service companies let you measure follow-up of leads, link inquiries to sales and determine return on investment. Reporting can be prepared as statistical analysis or graphs and charts. Reports can be given to you as printed documents, as e-mail file attachments you can view using common programs like Excel(r), or they can be viewed, downloaded or printed on demand at secure Internet sites using your web browser. Ongoing broadcast email, broadcast fax and email programs can be implemented by the sales lead management service companies to keep in touch and build a sales-winning relationship with your prospects and existing customers. Your printed literature, samples and other printed or electronic merchandise can be stored at the sales lead management service companies and be shipped on demand to your prospects and customers, as well as to your sales offices, dealers, distributors. In addition, many sales lead management service companies have negotiated deep discounts with UPS(r), FedEx(r) and other freight and package carriers, resulting in savings which they can pass along to you. Some companies also provide sophisticated processing and cashiering of checks and credit card orders. “Doing it yourself” can be a great idea until you take into account all the B2B marketing and communications responsibilities you already have. Outsourcing your inquiry handling and sales lead management sometimes proves to be a better alternative. Aside from the reality that business often forces you to delay your inquiry handling or give it a lower priority than it deserves, there are problems associated with staffing. For example, it is difficult to staff for the peaks and valleys in inquiries, sick time and vacations. Where do you find service companies to assist you with inquiry handling and sales lead management? Ask your peers at other companies. Ask the folks at your advertising agency. Check the display and classified ads in industry publications like B2B, Direct, DM News, Sales & Marketing Management, Target Marketing and Exhibitor or the directories they publish. Do searches on the Internet using key words like “inquiry handling,” “sales lead management,” “response management” or “literature fulfillment.” Check with marketing associations like the Direct Marketing Association (www.the-dma.org).